I WISH we had this California weather right now - but I finally had the time to import a few photos that we snapped from our trip a few weeks ago. 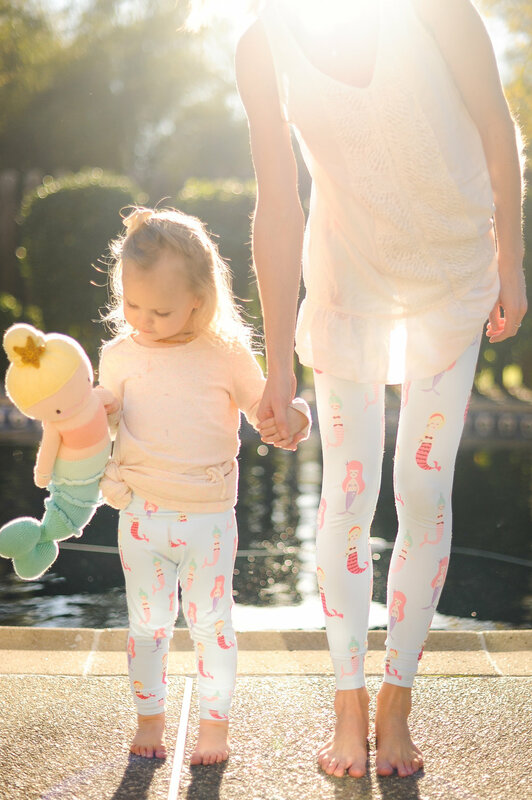 I can non-embarrassingly say that we have since taken off these adorable matching mermaid yoga pants from Flexi Lexi Fitness. They are s e r i o u s l y theee most cozy pair of leggings I own.. & most certainly Bella's too. I am wearing a size small in women's and Bella is wearing an x-small in kids. Ava has a pair too that we are just waiting for her to leaaan a bit and get more length haha. ^ We tried.. and failed miserably at the yoga poses I Googled 5 minutes beforehand. But THAT FACE. 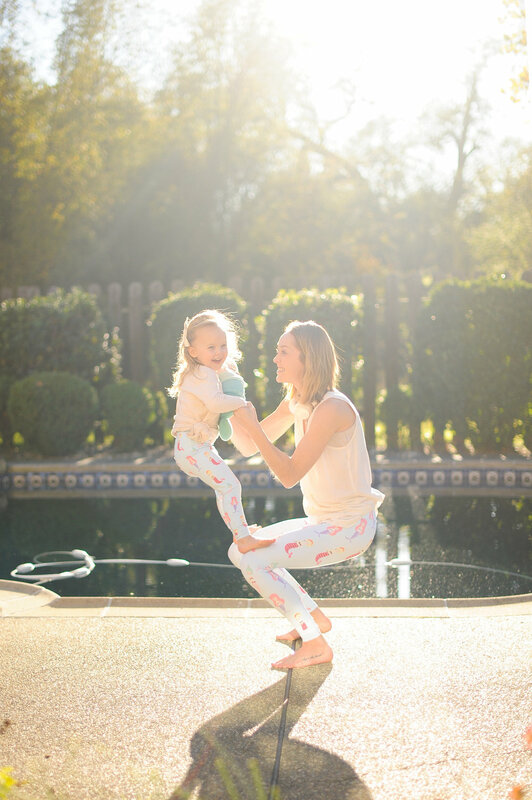 She loves to pretend I'm a jungle gym 98% of our time together - so I knew she would be game to climb on me for a few funny shots to share. I am so obsessed with the mermaid print [you can click on any image to zoom] the little illustrated mermaids are just adorable, and the the overall light blue background compliments each different colored mermaid so well. Speaking of mermaids.. Cuddle & Kind recently sent "Skye" the mermaid to Bella (and no I couldn't wait till Christmas to give it to her) and she has yet to leave her side. Click here to purchase Skye the mermaid! TODAY IS THE LAST DAY TO PURCHASE in order for it to arrive in time for Christmas! Bow - Stella Bella Co.